It’s not as complicated as you might think. You’ll need some seeds (then plans as to where your going to eventually plant them), peat pots (I often use cardboard egg boxes), starter mix (how to make your own), water, a tray with an edge (to keep pots on and help with any water run-off), plastic wrap or a plastic ‘dome’, a warm place and an area (relatively warm) which gets indirect sunlight throughout the day. And most importantly, patience. I don’t have any gadgets or anything fancy from ‘specialty’ garden shops – I just use what I have. I buy the seed starter mix from a local gardening shop (the bigger bag usually lasts me two seasons). 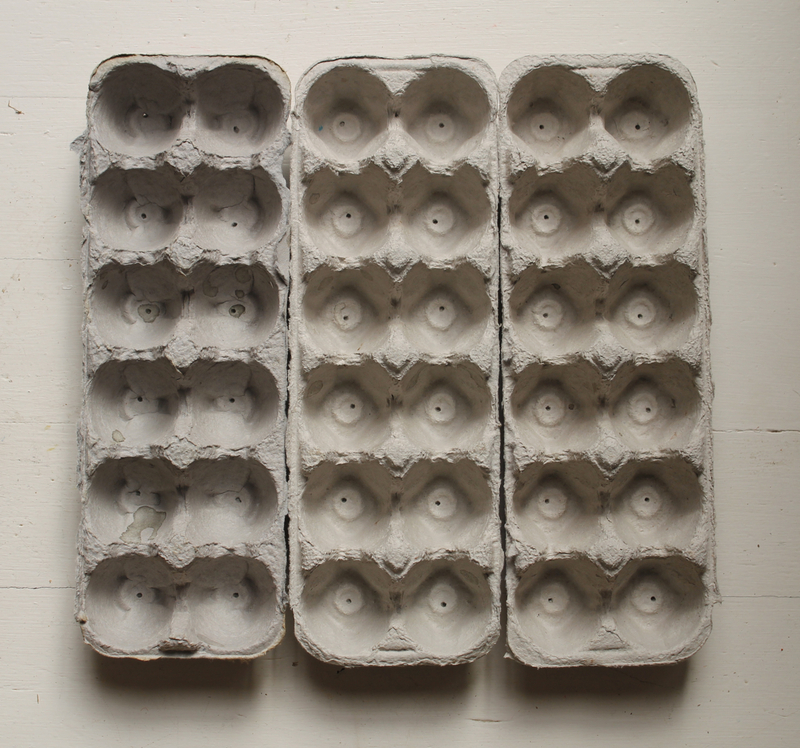 I typically (though not for these photos) re -use egg cartons (cardboard) and pierce small holes in the bottoms of each holder for drainage. A large sheet pan (picked up at the dump) comes in handy for storing all the pots while the seedlings are emerging – it also makes moving them around very easy…I picked up a spray bottle for $1 and use it just for watering the seedlings (year after year) and while I did re-use a plastic dome for years, it finally gave way and now plastic wrap is what I use (and re-use). I know, plastic wrap? I haven’t been able to find a suitable (and earth friendly) substitute…any ideas? 1. Place pots on a large tray (with sides preferably, but not necessary). I fill each ‘set’ of pots on a smaller tray, first, then move onto the bigger tray once complete. 2. 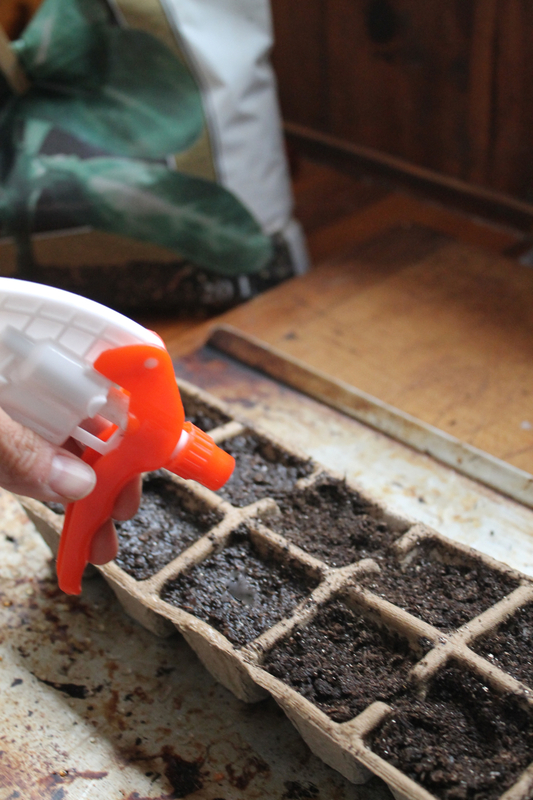 Fill each pot (peat pots, seed trays, or pierced egg cartons) with the seed starting mix . I use an old metal measuring cup to scoop and fill…be sure to fill each to the top, the mix will settle once moistened. 2. Water thoroughly. * This will take a bit of time…I water the mix and then let it rest awhile before planting. The water may rest on top for awhile before finally settling, fully into the pot. Do be sure the entire pot is moist before planting and then be sure to keep it moist once the seeds are planted. 4. Read the planting instructions for each seed type (some like to be deep, others do not) and plant accordingly. 5. 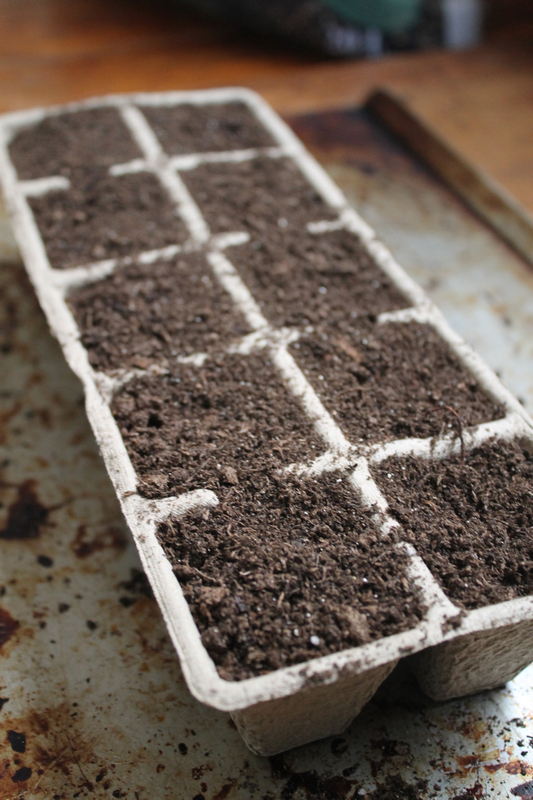 Cover with soil, gently (if necessary – some seeds need to sit right on top). 6. Water thoroughly with a fine spray mist. and once the sun comes ’round to the sunroom (which we can now start to use!!) I move them again, onto the ottoman in there. Yes, I am busy with these seedlings, but it’s worth it. If your lucky enough to have a spot which receives indirect sunlight all day, all the better. If you don’t have a warm spot to overnight them, consider using an electric blanket (do be cautious and mindful about possible fire hazards!) or making your own. Check out what Kate over at The Museum of Forgotten Pickles has done to make her own heating mat. 9. Lift plastic daily and check moisture levels. I check them first thing in the morning and then just before I go to bed. You want to be sure to keep the seedlings properly moistened. Try not to let the ‘soil’ dry out or the seeds won’t be able to grow. Using your spray bottle, moisten daily (if needed). 11. 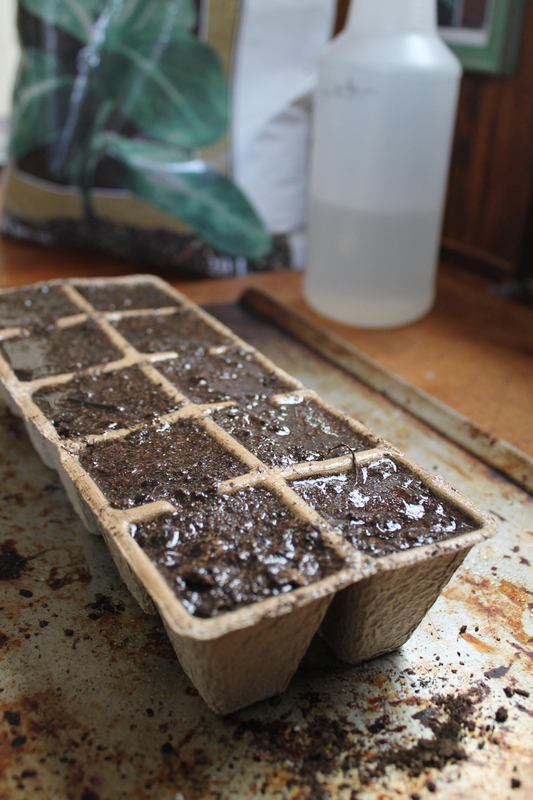 Keep seedlings moist until they are big enough to transplant. Want to learn how to transplant? Read here. 12. 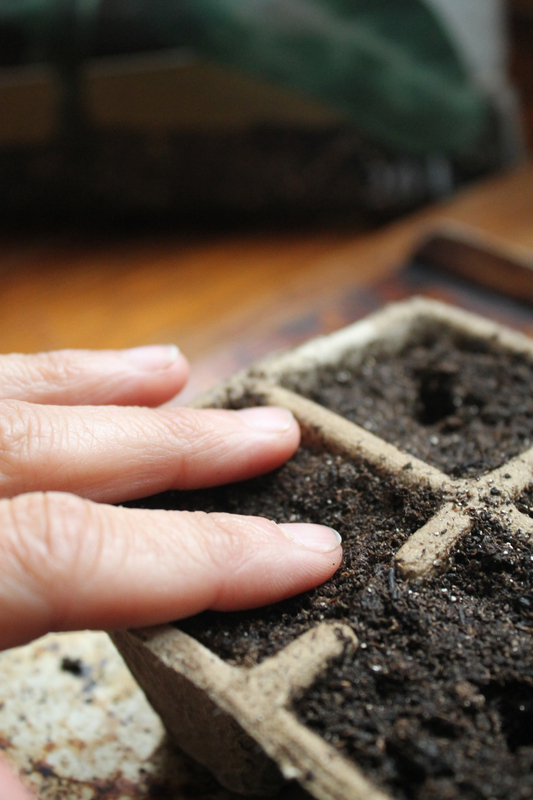 ‘Thin’ seedlings to one plant per pot, once big enough… Meaning gently remove all but one plant; best to do after watering, as the water will help keep the seedling you want to keep in its’ place. 13. Keep growing the seedlings in these beginning pots until each grows the first set of true leaves. Once they have this set of leaves they are able to be transplanted into bigger pots before going outside. 14. Keep in mind, plants which have started off this way will need a time for ‘hardening off’ before being able to be planted outdoors. 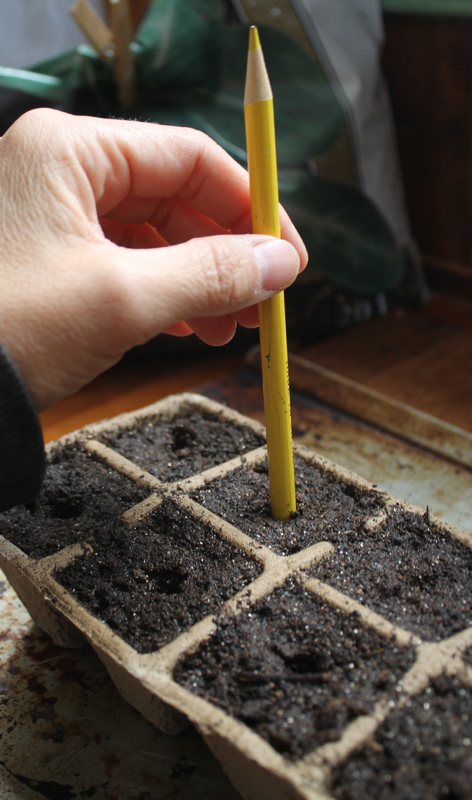 Starting seeds is not a complicated process. 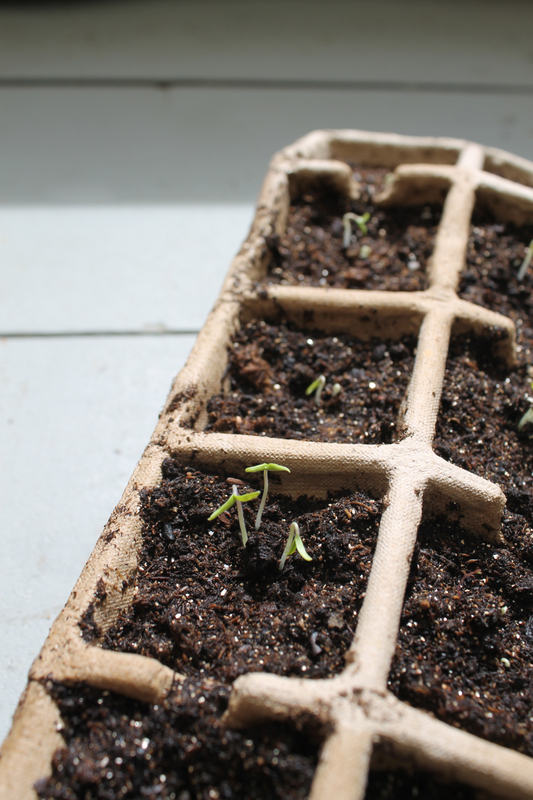 It usually takes anywhere from a week to a few weeks to see the first seedlings sprout (my tomatoes above popped up after only five days!) and when they do, it’s so exciting! You’ll not only be proud of the fact that you’ve started your plants from seed, but you’ll also know what’s in them. If possible, avoid any Monsanto tainted seeds and go for organic or locally procured seeds…there’s enough GM seeds out there, let’s not add to them! 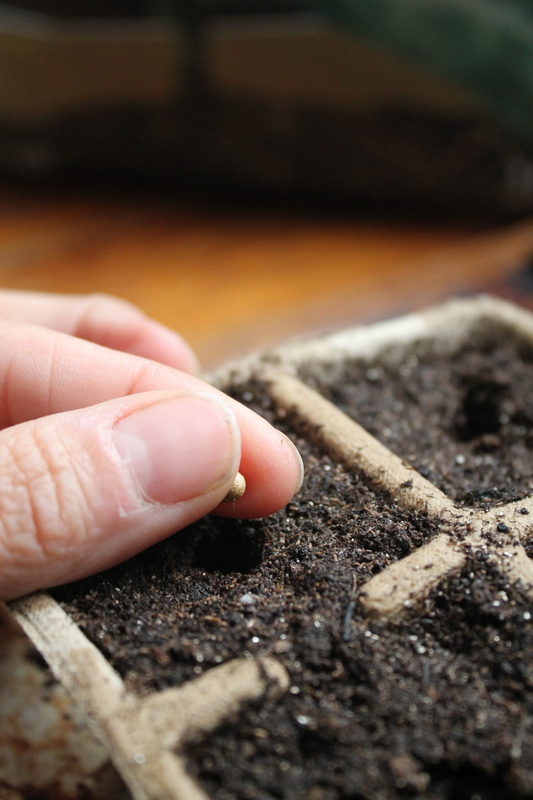 Have you started any seeds lately? This entry was posted in everyday life, gardening, simplicity and tagged DIY, gardening, how to start seeds, indoor planting, organic gardening, photography, seedlings, self-sufficient by ripe red berries. Bookmark the permalink. It’s so much fun to watch all those little seedlings emerge! My tomatoes are all up and my chili peppers are just starting poke through. Thanks for the link, and happy planting! I thought seats again. They never make it to the garden. There is always some issue with them. But I refuse to give up. I will try. I thought that was an oops…(: Keep trying with those seeds! My seeds are dead. I had to invest the dollar or two in greenhouse flats. 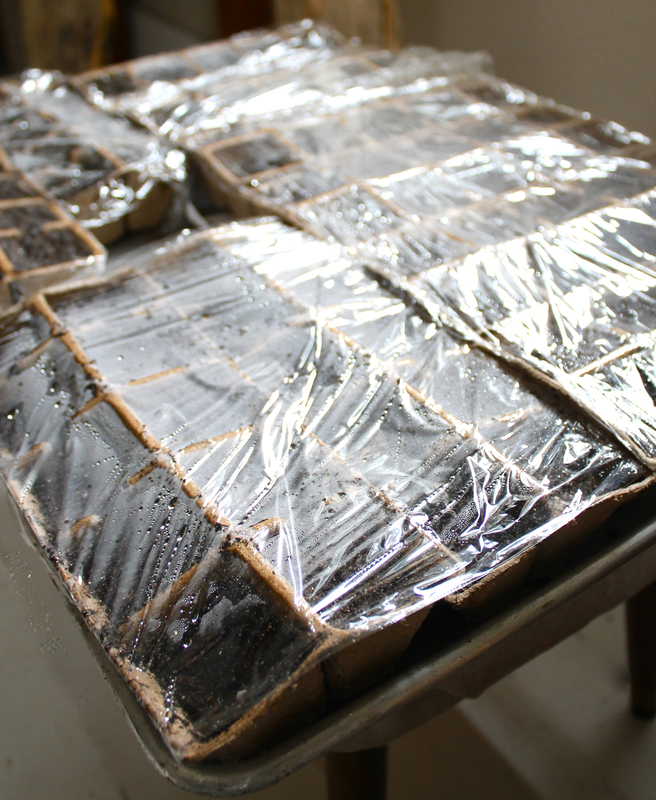 Sorry to hear they didn’t germinate for you…bummer, to say the least! I’ve purchased greenhouse flats before and used them until the plastic gave out – actually I still have a few bottoms that I’m still using, after years of use, but the tops gave out years ago… it’s all the plastic I try to avoid, not the cost…hopefully you’ll have more luck this time. Lots of light, warmth and water – fingers crossed for you!